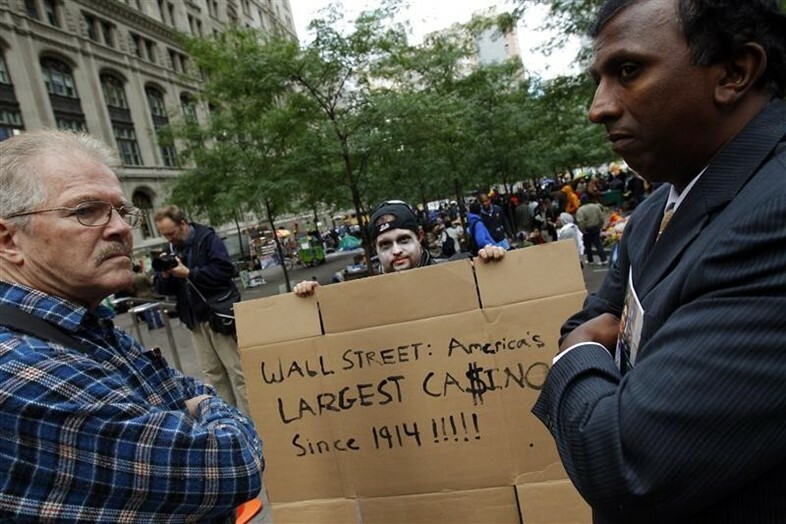 “Occupy is just unlike anything we’ve ever seen before"
Filmmakers Audrey Ewell and Aaron Aites spent over a month filming the Occupy Wall Street movement in Zuccotti Park, New York, to produce their documentary 99% – The Occupy Wall Street Collaborative Film (trailer below). Here, Audrey looks back on her time spent at the camp and the legacy of Occupy, two years after it was raided by police. The news was talking about a few people in the park, sock puppets, yoga... So when up to a thousand people marched across the bridge and 700 got arrested, it made us curious: what weren’t they covering if they weren’t covering the bridge arrest? We went down to Zuccotti Park, and I'd never seen anything like it: people from all over the country were there; a real mish-mash of ethnicities; blue-collar, white-collar, all ages and backgrounds, standing up and talking about their lives. There was no one centralised voice, but if you listened to a few of the stories, it just kept coming back to the same basic idea: whether it was student debt or unemployment, the system was broken and wasn’t working for average people anymore, and people didn’t know where else to turn. So they came together. That night, we decided to start 99% – The Occupy Wall Street Collaborative Film. By the end of filming, we had about 18 terabytes of footage, gathered from filmmakers all around the country; we got into Sundance last year so we were editing right up till the festival. We were there a bit later on the night Occupy got shut down. There were about a thousand, two thousand people; cops were standing around the park, keeping people out. I was nearly arrested that day for filming: an officer tried to pull my camera away from me, another grabbed my arm – all around me, people were screaming, “She’s press, she’s press!” The police aren’t supposed to stop press covering something, but they were arresting press left and right. Police brutality was such a commonplace occurrence, though, we saw it effectively every day we filmed. But it was clear the next day that people weren’t going to be let back in. The National Lawyers Guild had sued on behalf of the occupiers and they lost. There were new signs up: no camping, no backpacks, no tents. What had been a public park was now a restricted use park. Yesterday I heard a professor speak about how non-violent movements can take eight years to take hold. Ironically, violent movements can be more effective in a democracy, because otherwise it’s too easy for protesters to be ignored. It’s too soon at this point to know what Occupy's long-term legacy will be. Occupy is just unlike anything we’ve ever seen before. It has this sneaky abstract quality where it’s here one moment, gone the next. But people weren’t really talking about income equality in the United States much at all before Occupy, and now it seems to be more of an issue: Bill de Blasio is running for Mayor in New York on some of these ideas. A lot of people who were part of Occupy are still involved in projects like Occupy the Congress; groups like Move To Amend are working to change the Constitution so corporations aren’t granted the same legal rights as people, which means they're allowed to donate as much money as they wanted to political campaigns. It's really screwed our political system; our politicians are basically paid for by corporate interest now. In the film, we actually look at the numbers, and there’s actually no denying that America has become a much more unequal society in the last 30, 40 year – and it’s accelerating rapidly. There’s no argument, that is fact. I’m not going to sit here and pretend that there isn’t a real inequality and injustice taking place here in America. There is a huge injustice taking place. Occupy happened because there are all these issues underlying our economic and political system in America. So for us, it was about ferreting out the truth of what was happening and looking at how these aspects of our political system are affecting everyday Americans. Here’s the deal for me: you may not have liked the way occupiers look, the way they organise, the way they look or the music they listen to – but that doesn’t mean you can afford to ignore their message.